DUMBARTON slumped to yet another defeat in the Betfred Cup — in which they have never won a match — in front of a 426 crowd at Broadwood. Ex-Sons player and manager Jim Chapman's Clyde recovered from going behind in the first half to win 2-1. Much of the first half was rather scrappy, but Sons enjoyed the majority of possession — and a couple of close chances for Ally Roy. Clyde were confined to counter-attacks. On 37 minutes Dumbarton took the lead through a Craig Barr header that crashed down from the crossbar and landed just over the line (pictured). After the break Clyde started to come back at Sons with fresh energy. On 56 minutes the home side found an equaliser. 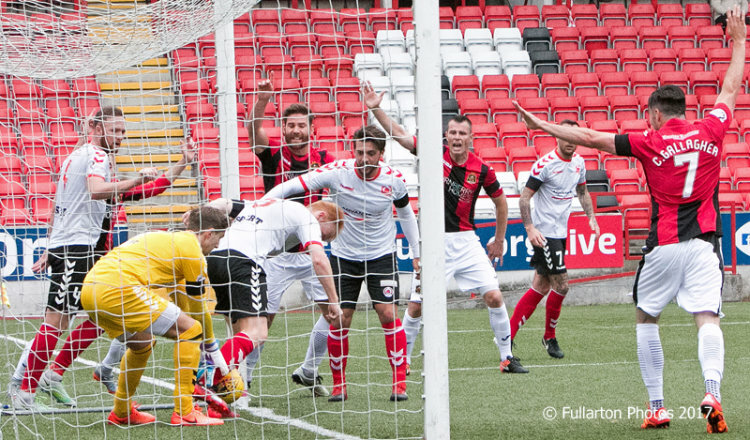 Former DFC player Darren Miller curled the ball into the top corner from 20 yards out and from a tight angle. There was almost a second for Clyde moments later, with Andy Dowie rescuing a spill from goalie Scott Gallacher after a Max Wright shot. The Bully Wee took the lead on 66 minutes when Wright made no mistake from a close header after some weak Dumbarton defending. Christian Nade, coming on for Calum Gallagher, almost levelled with a thunderous strike on 69 minutes, with David Smith following suit shortly afterwards.